Your x-ray is taken in less than a minute and is immediately available to our team of professionals for viewing on the computer screen in your private studio. This provides the highest level of detail available in x-rays today. In each of our private studios we have the capability of taking a full set of digital x-rays to completely assess your oral health. Boulder general dentist, Dr. Lori Kemmet, believes that digital x-ray technology is more environmentally sensitive than previous processes because it does not entail developing or processing x-ray film with hazardous chemicals that can threaten the water supply. Additionally, x-ray exposure is dramatically reduced (about 80%), making it a safer choice for our guests. This is the early stage of gum disease that affects only the tissue (not the bone). Some forms of this disease affect as many as 50% of the population, without their awareness. Red or swollen gums that bleed easily usually indicate gingivitis. When treated early, the tissues heal very quickly. Pregnancy gingivitis is very common. Gingivitis left untreated can progress into periodontitis, which eventually destroys gum tissues, ligaments and bone which hold your teeth in place. While gingivitis only affects tissue, periodontitis silently eats at the bone around the tooth, usually without any warning or discomfort. Even though your teeth may be healthy, they can still be lost, because there is no bone left to hold them in place. As the infection spreads there is a greater chance it can reach your heart and vital organs with serious and sometimes fatal consequences. New studies link gum disease to stroke, heart disease, diabetes, low birth-weight babies and more. This software allows us to monitor your health from visit to visit. At each cleaning visit our hygienist measures the health of tissue at six locations around each tooth.This amazing customization of your hygiene care ensures early detection of both gingivitis and periodontitis. Our ability to monitor each visit will better help you understand where extra care at home is needed. Before proceeding with a cosmetic and/or functional enhancement, we want to allow for proper gum-tissue health. A revolutionary way to remove hard deposits and stain from the teeth with efficiency and comfort. Our hygienist uses this before each cleaning, the tip of the instrument uses vibrational energy to clean and water to cool the tip. Ultrasonic cleanings also flush bacteria from underneath the tissue and promote tissue healing and health. Oral health and the appearance of your gum tissue help define your smile. We have sought out technology and well trained hygienists to support and maintain healthy gum tissue. They offer antibiotic placement and laser therapy to improve the health of gum-tissue. Lasers are the latest technology to keep the cleanest mouth clean and the least healthy mouths a chance to heal. 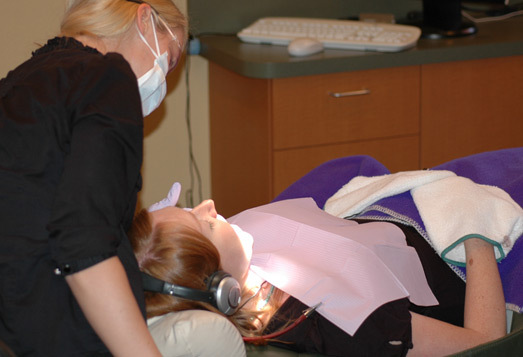 We offer laser bacterial reduction to each guest before a teeth cleaning. This painless procedure adds 5-10 minutes to a normal teeth cleaning and prevents the spread of bacteria from unhealthy parts of the mouth to healthy parts of the mouth. It also kills the bacteria which cause periodontal disease and advanced periodontal disease. Lasers promote tissue healing and health. The laser can determine the difference between healthy tissue and diseased tissue. It has extreme precision and little post operative discomfort. Lasers provide an optimal environment for rapid healing and are one of the only ways to regain bone after it has been lost. Once an area of infected tissue has been cleaned, we offer a localized antibiotic to continue the healing process. It takes no time to place Arestin in an area and the antibiotic is released for two weeks under the tissue, giving it the best chance to heal. Its often hard to know if you have oral cancer and 25% of people with oral cancer had no contributing risk factors. Early detection of cancer in the mouth saves thousands of lives a year. Dental professionals are often the first to detect the signs of oral cancer. Both the hygienist and Doctor check for oral cancer during each visit. We also offer solutions that will show the cancer with more clarity, such as Vizilite. Teeth often become sensitive to hot and cold. There are many ways to take this from a very uncomfortable situation to being resolved. Laser technology also allows us to desensitize teeth. Fluoridex tooth paste is another way to help make those surfaces strong and resistant to sensitivity. MI Paste is a natural product derived from milk proteins which can also accomplish this effect.